The click-on stubble combs allow you to trim hair to different lengths. The indication on each comb corresponds to the hair length in millimeters. Start with the 5-mm comb to practice with this appliance. Place the comb onto the blade, with the teeth of the comb pointing upward. Note: Always trim in the direction of the teeth of the comb. This will give you the best results. Place the comb onto the skin and move the appliance in the direction of the teeth of the comb. Note: For the best result, move it against the grain. To remove the comb, hold it on both sides and pull it off the blade. 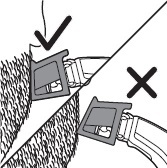 Always make sure that the tips of the click-on stubble comb point in the direction in which you move the appliance. 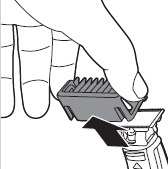 Make sure that the flat part of the comb is always in full contact with the skin to obtain an even trimming result. 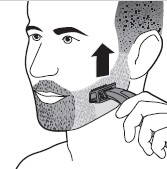 Since hair grows in different directions, you need to hold the appliance in different positions as well. Trimming is easier when your skin and hair are dry.